Our mission at Tease Salon is to provide our guests with an amazing experience each time they visit our salon. Our open chair environment and strong team culture allows our guests the unique opportunity to work with multiple stylists within the same salon. Our guests can experience all of the knowledge, education, and creative talent from their favorite stylist or our entire team. Each of our stylists have their own style, skill set and technique. While we are all very different individuals, we all come together to create amazing work as a collective. We are all passionate about hair and we LOVE what we do! When you have an entire team of highly talented and creative professionals with different ideas available to you, you will never have to go anywhere else! 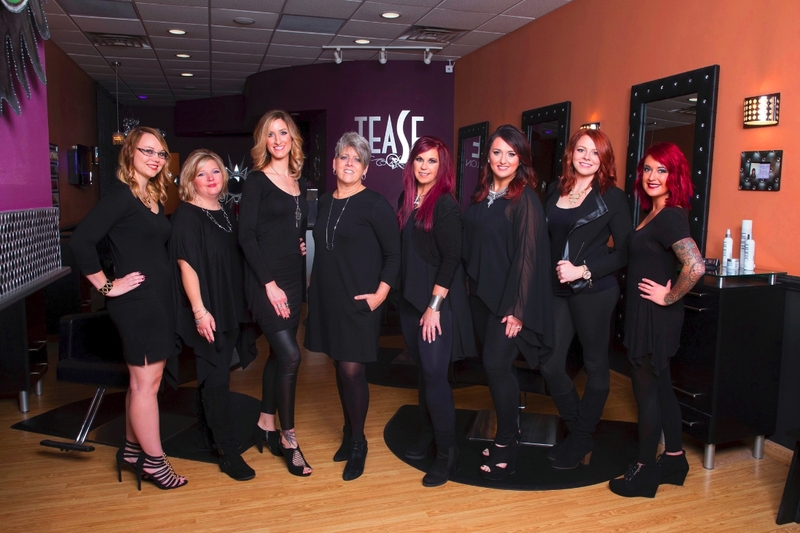 Tease Salon was founded in 2014 and quickly built a reputation for doing amazing hair! This trendy, hot spot for hair has a completely different vibe than your average salon. After being in business for just three short years, Tease quickly grew out of it’s original space and needed to expand into a bigger place. We took a huge leap of faith, moved all of our stuff, along with our clients, and landed in Middleburg Heights. It was the best decision we ever made! 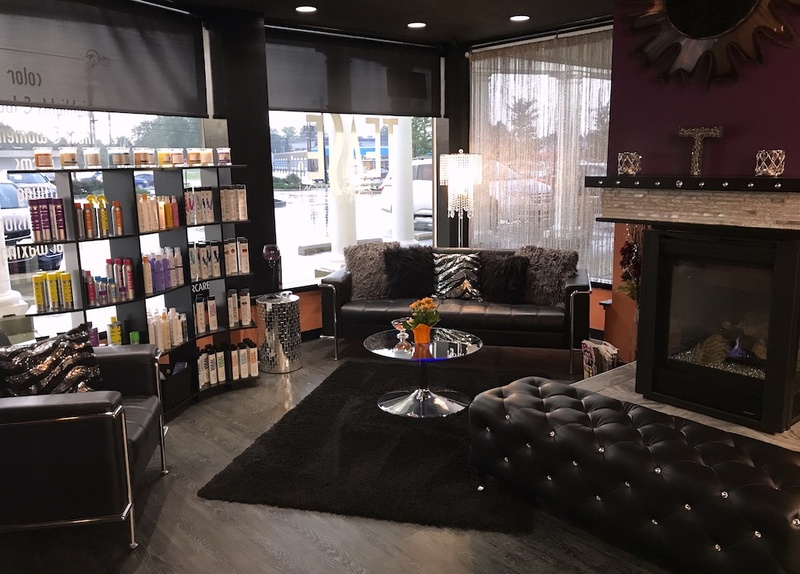 We did a complete remodel, added three more styling stations, hired five more super-talented stylists and here we are today…winning more awards, getting more recognition and putting out even more amazing hair…one head at a time! Our team is committed to giving you the most envied hair in town. All of our stylists have years of experience and are trained in advanced color and cutting techniques. Whether you want to keep it simple and update your current look or if you’re ready for a big change like an edgy new cut or fun color, we can make it happen! We LOVE all things hair and we are all about education! That’s why we continue to bring you the latest products and new color and cutting techniques that are always on trend. We also understand it can be difficult to find a stylist that you can really connect with. That’s why we thrive by working as a team in our open chair environment. We want you to always feel comfortable about switching up stylists in the salon until you find just the right fit. Our ultimate goal is for YOU to be happy and enjoy your experience at our salon! 2014 – Featured in the Salon Smart online portfolio of salon interior design ideas. 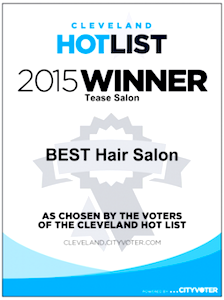 2015 – Ranked #1 Best Hair Salon in Cleveland on The Cleveland HOTLIST. 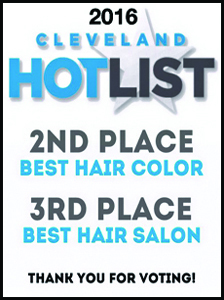 2016 – Ranked #2 for Best Hair Color in Cleveland on The Cleveland HOTLIST. 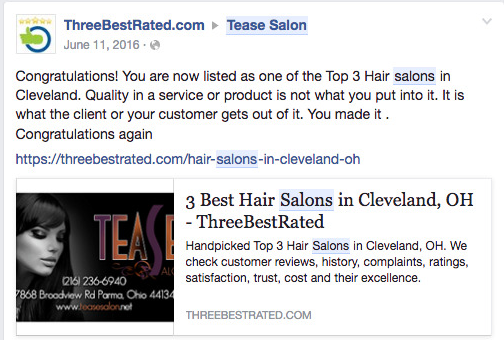 2016 – Ranked #3 for Best Hair Salon in Cleveland on The Cleveland HOTLIST. 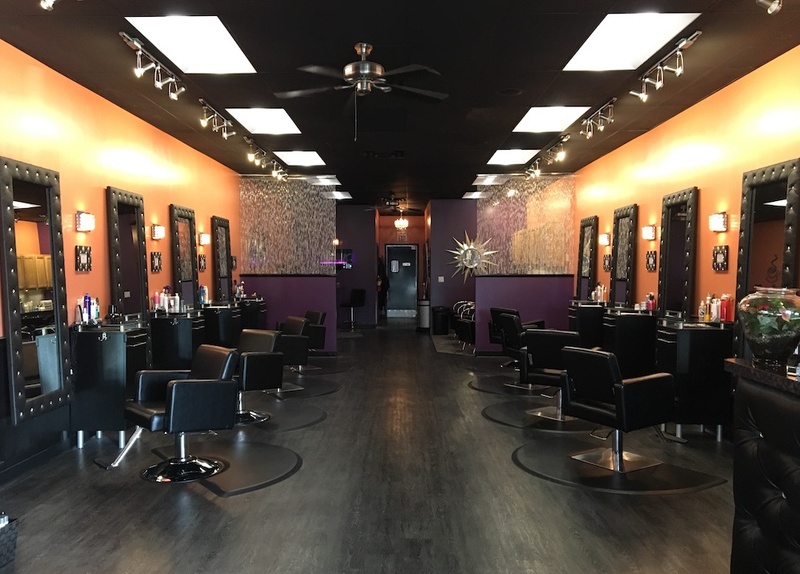 2017 – Ranked as one of the Top 19 Hair Salons in Cleveland by Expertise.Com. 2017 – Ranked #1 Best Hair Color in Cleveland on The Cleveland HOTLIST. 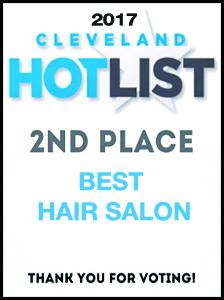 2017 – Ranked #2 Best Hair Salon in Cleveland on The Cleveland HOTLIST. 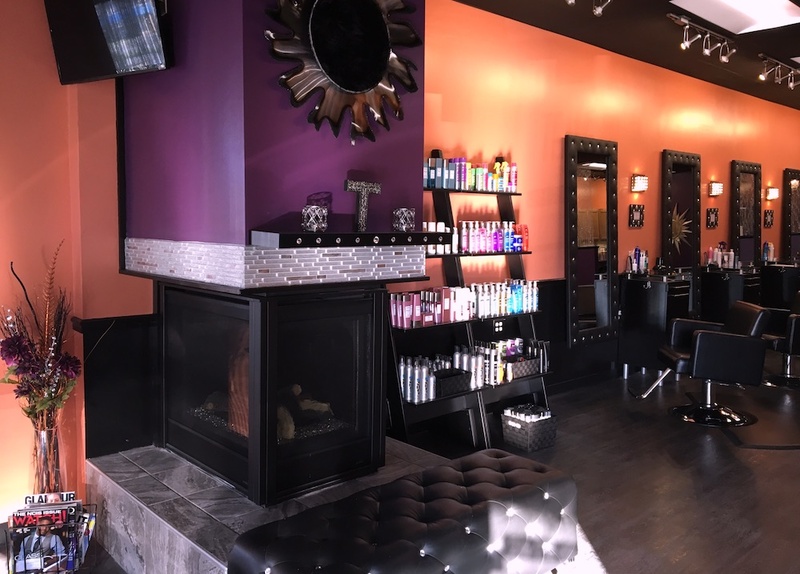 2018 – Chosen as one of the Top 19 Hair Salons in Cleveland by Expertise.Com. 2018 – Featured as a Spotlight Salon at SalonTarget’s Beyond The Software Blog. 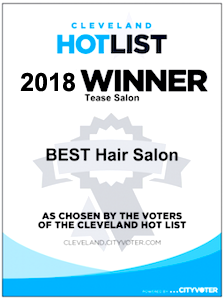 2018 – Ranked #1 Best Hair Salon in Cleveland on The Cleveland HOTLIST. 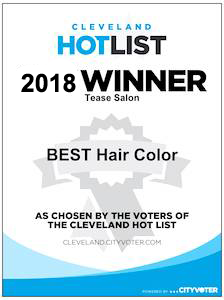 2018 – Ranked #1 Best Hair Color in Cleveland on The Cleveland HOTLIST. You can also find some our work regularly featured on the Sophisticate’s Hairstyle Magazine Instagram Page as well.